Home Christian education What Does the Bible Say? 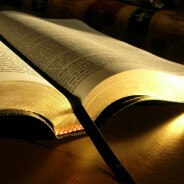 Posted by admin on Aug 5, 2008 in Christian education | Comments Off on What Does the Bible Say? But teach them what? Clearly, God has a great deal to say about this. And before that question is answered, another must be dealt with: “What or who is the most important thing or person for the child to know?” The answer is, “God is the most important person for a child to know.” The goal of Christian parents is for their child to know God in a personal way and to know all about God. Nothing could be more important. With those two simple facts in place as the foundation of our discussion, we can now look at what God has to say more specifically. God says that the education of children and youth is a 24-hours-a-day, 7-days-a-week process that must take place from birth through maturity. Note the Deuteronomy passage below and the context. God is instructing His people how to live as they prepare to go into the Promised Land. Critical to the life and health of His people is the teaching of the Word of God by parents on a daily basis in every situation.